Robert P. Crease traces the evolution of this international system from the use of flutes to measure distance in the dynasties of ancient China and figurines to weigh gold in West Africa to the creation of the French metric and British imperial systems. The former prevailed, with the United States one of three holdout nations. Into this captivating history Crease weaves stories of colorful individuals, including Thomas Jefferson, an advocate of the metric system, and American philosopher Charles S. Peirce, the first to tie the meter to the wavelength of light. 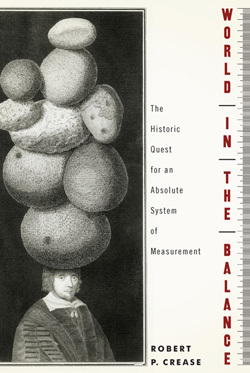 Tracing the dynamic struggle for ultimate precision, World in the Balance demonstrates that measurement is both stranger and more integral to our lives than we ever suspected.